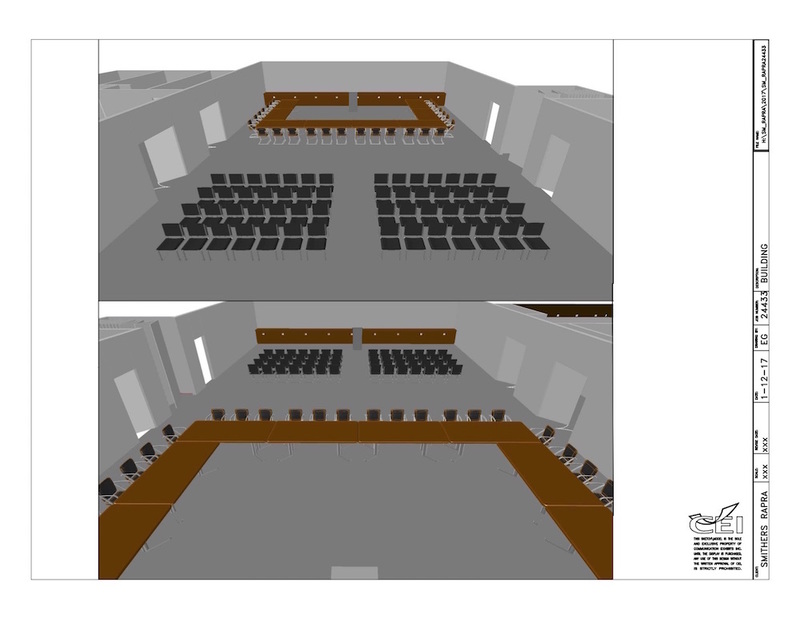 The new multi-purpose conference space is 5,304 square-feet. AKRON, Ohio - Aug. 17, 2017 - PRLog -- Smithers Rapra, a world leader in rubber, plastics, and composites testing expertise, announced today a major expansion at the Smithers Winter Test Center in Brimley, MI, to be opened mid-January 2018. The additions include a conference center, cafeteria, 130 acres with new track surfaces, and two rental buildings. "Having a space to showcase new vehicle technology and hold driving events, as well as supporting on-site staff with a cafeteria, was a critical need for our clients," said Sean Connolly, General Manager, Smithers Winter Test Center. "The expansions at our winter proving grounds will address these needs, while providing additional track space for driving and training events, along with new testing areas. The new facility will also be a great asset to the local community for events and meetings. " • 38 acres for developing a large snow field, deep snow area, and expanded ice area. • 13 acres dedicated to demonstrations, training, and exclusive use tied to the new conference building. • 30 acres for an exclusive track with a testing partner on site. • 49 acres available to other testing partners to expand. "Our Winter Test Center can fulfill just about any testing for snowy or icy surfaces; the new additions of space and facilities will give our clients a winter 'whiteboard,' where we can recreate almost any scenario they wish," said Jim Popio, Vice President, North America, Smithers Rapra. "Automotive components need to meet the challenges of real world conditions, and winter driving can be some of the most challenging terrain for development engineers to consider in their development efforts." Smithers Rapra operates laboratories in North America, Europe and China, covering a wide variety of testing and consulting services from material chemistry and product durability testing, to tire, wheel, and winter testing. Smithers' global network of ISO 17025 accredited test laboratories perform a wide variety of SAE, ASTM, ISO, UNECE and EC tests supporting raw material suppliers, tire manufacturers and automotive OEMs. Smithers Rapra has been a trusted partner of the plastics and rubber industries for over 90 years. Our business is built around delivering a complete portfolio of rubber and plastic testing services to support a wide range of industry sectors including tire, automotive, polymer products, oil and gas, medical device, pharmaceutical, transport, packaging, industrial, and consumer products. A member of the Smithers Group of companies, Smithers Rapra is one of six member companies providing technology based services to a diverse set of industry segments. By integrating science, technology and business expertise, Smithers' goal is to add value throughout the lifecycle of our clients' products. Learn more at http://www.smithersrapra.com.